The U.S. healthcare market witnessed a series of activities in 2018. 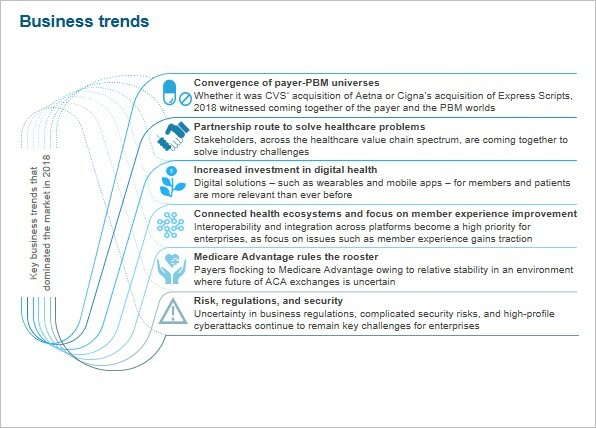 On one side, payers continued their quest for consolidation across the value chain by merging with PBMs, acquiring physician practices, and investing in technology consortia; on the other side, healthcare providers too tried to expand their influence through large mergers as well as by acquiring small physician practices. The entry of technology firms, such as Amazon, Apple, and Microsoft, further complicated the market scenario. In addition to the stakeholders’ quest for control of the market, the ongoing issues pertaining to value-based care transition, regulations, and cybersecurity also continued to push the payers and providers to invest in new technologies (analytics, automation, IoT, cloud, etc.). With this slew of changes, the healthcare in the United States is at an inflection point, with everything from member/patient engagement to administrative management to care delivery being transformed. For payers and providers, the path ahead lies in transforming the way they typically work by imbibing technology. The third-party technology and service providers will play a significant role in helping the payers and providers achieve that.